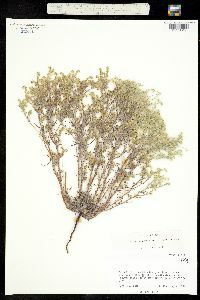 Duration: Annual Nativity: Native Lifeform: Forb/Herb General: Low annual herbs, 8-25 cm tall; stems slender, much branched at the base and above; branches ascending or decumbent, brownish, sparsely hispidulous with slender white hairs, the epidermis eventually exfoliating in irregular strips and shreds; roots occasionally red-purple. 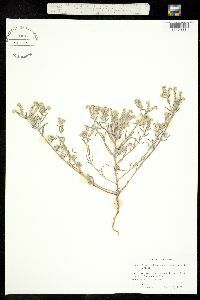 Leaves: Alternate and sessile, clustered at the base and scattered along the stems; blades linear, usually 1 mm wide or less, 5-30 mm long, and rough-hairy, the hairs bulbous-based. Flowers: White, in numerous short scorpioid spikes, these elongating in fruit; calyx lobes lance-linear, 1-1.5 mm long at anthesis, hispid with stiff spreading hairs; corolla white, funnelform, about 1.5 mm long, the limb 1.5-2 mm broad. Fruits: Nutlets 4, usually with 1 nutlet larger than the others, about 1.5 mm long; all nutlets ovoid and acute-tipped, brownish or pale gray and covered with pale tubercles; lateral angles rounded or rather sharp; ventral groove narrow; style surpassing odd nutl Ecology: Found in gravelly or rocky soil on hillsides, along washes, and on disturbed soil below 4,000 ft (1219 m); flowers February-June. Distribution: c and s CA, s NV, s UT, AZ, s NM, s TX; south to n MEX. Notes: Cryptantha is a genus of bristly herbs with white or yellow flowers in spikes that are usually 1-sided and curling like a scorpion-s tail (-scorpioid-). The seeds, called -nutlets- in the borage family, are crucial to identification of the species. As the nutlets are quite small and difficult to examine in the field with a hand lens, it is usually necessary to make a collection of mature material for later identification under a dissecting scope. 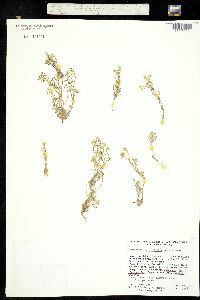 C. angustifolia is distinguished by a being slender-stemmed, much-branched annual, mostly decumbent or ascending; having a bractless inflorescence; calyx lobes not recurving; 4 dark nutlets per flower, one usually a bit bigger than the others, all of them tuberculate (covered in bumps, which are lighter in color than the rest of the nutlet) and with the style reaching to just beyond the tip of the larger nutlet. 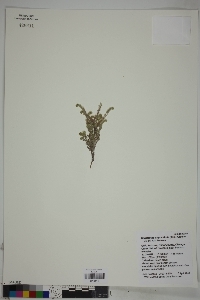 Appears similar to C. micrantha but that the roots of that species are always charged with red dye, and the plant is generally smaller, with all the leaves less than 1 cm long and nutlets 1 mm long. 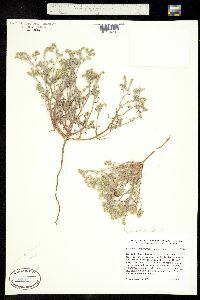 Ethnobotany: Unknown, but other species in the genus have uses. 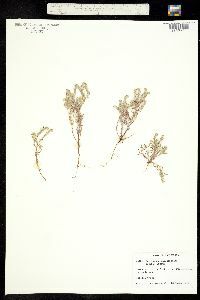 Synonyms: Eremocarya angustifolia, Johnstonella angustifolia, Krynitzkia angustifolia, Eritrichium angustifolium Editor: SBuckley 2010, AHazelton 2015 Etymology: Cryptantha comes from the Greek krypto, "hidden," and anthos, "flower," a reference to the first described species in the genus which has inconspicuous flowers that self-fertilize without opening; angustifolia means narrow leaf.